Yet even as regulators investigate the causes of the Deepwater Horizon disaster, the broader dangers posed by the industry’s push into deeper waters have gone largely unscrutinized. Underwater, both powerful currents and mudslides play havoc with delicate equipment and the pipelines that bring oil and gas back to shore. The water temperature, which hovers at just above freezing at depths below 3,000 feet, can harden natural gas into crystallike structures called hydrates that can clog pipelines and other equipment. And because the wells are deeper than human divers can go, oil companies must rely on remote-controlled submarines to maintain their equipment or perform repairs. ... Although the cases of narcolepsy have been reported in temporal association with the use of Pandemrix, it is at present not known if the vaccine caused the disorder. The Agency’s Committee for Medicinal Products for Human Use (CHMP) will look carefully at all of the available data to determine whether there is evidence for a causal association. As part of this evaluation the Committee will also consider the so-called background rate for narcolepsy, i.e. the number of cases that would normally be expected to be diagnosed. The Committee will be working with experts from across the EU to assess this possible safety concern and any impact on the benefit risk balance of Pandemrix. The Committee will consider at its September 2010 meeting the need for any provisional measures pending completion of the evaluation. The Agency is also liaising with the European Centre for Disease Prevention and Control (ECDC), international regulatory partners and the World Health Organization (WHO). The European Medicines Agency will provide updates as new information becomes available. Hmmm. What exactly is a textbook suicide, Dr. Nicholas Hunt? The most common suicide in males would be associated with alcohol excess and a gun death. Suicide attempts do frequently involve use of more than one drug in large quantities, but I have never seen someone try drugs and cutting an artery at the same time. If Kelly died of blood loss, which seems very unlikely, the blood had to go somewhere, but it hasn't been found. So if he didn't die from blood loss (you have about a gallon of blood per person, and roughly more than half needs to be lost before you die... we frequently see patients with more than half gone from gastrointestial blood loss and they almost always live) and the blood levels of drugs were way below fatal levels, what did cause Dr. Kelly's death? If he died of a cardiac arrest due to blood loss, there needs to be evidence to support the diagnosis. In his fascinating book The Strange Death of David Kelly, Norman Baker, now the transport minister, raises the interesting question of why Dr Hunt, relatively inexperienced at the time, should have been chosen to deal with what was a sensational case. Earlier this month, the Attorney General Dominic Grieve signalled that he is prepared to intevene, saying that those people who now want a new investigation into Kelly's death should not be dismissed as conspiracy theorists. 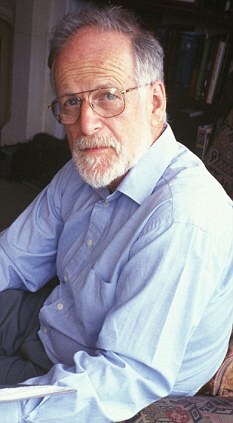 The truth is that Hutton failed to fulfil his remit to 'urgently examine the circumstances surrounding the death of David Kelly'. Instead, his inquiry concentrated on the roles played by Mr Blair and his advisers, concluding that they had no reason to feel any guilt and that Downing Street had not 'sexed up' the case for the Iraq War (something that Kelly had secretly expressed fears about to BBC journalists, before his identity was outed by the Labour Government). Only a tiny part of Hutton's 700-page report probed Kelly's death and the critical hours he was missing after taking an afternoon walk from his home in Southmoor. Amazingly, the chief inspector of Thames Valley Police force, which conducted the search for Dr Kelly, was not called to give evidence. Nor was the Ministry Of Defence doctor who gave Kelly a clean bill of health during a rigorous medical check eight days before he died. As a result of Hutton's failings, we still don't know the precise time and location of Dr Kelly's death - yet these basic facts are surely the most fundamental requirements of an inquiry into any violent or unexpected death. Here, the Mail reveals the other vitally important questions that must now be answered . . . was he poisoned? For more detail about multiple issues raised by the Mail, go here. For the first time, flu shots will be mandatory for students to attend Defense Department schools in Europe, education officials announced this week. Requiring stateside family members associated with the military to get the vaccine when others in their community aren’t would likely cause “a tremendous amount of resistance” from teachers, students and parents, Kilpatrick said. EUCOM is enforcing the policy because “our mission is to protect the health and safety of our beneficiaries,” Wyatt said. When a child gets sick, that can take a parent who has to stay home away from the mission, he said. The safety of a swine flu vaccine is to be investigated by European drugs regulators (EMEA, the European Medicines Agency) after it was linked to a rare condition that causes people to fall asleep suddenly. The investigation has been prompted after health officials in Finland announced they were suspending the vaccination programme there following reports of narcolepsy in people who had received the jab. So far there have been 27 reports of suspected narcolepsy in people across Europe who had previously been vaccinated with Pandemrix, the H1N1 swine flu vaccine made by GlaxoSmithKline. Agence France Presse reports that Finland and Sweden fear that narcolepsy in children could be a consequence of receiving GSK's Pandemrix flu vaccine. Pandemrix is last year's swine flu vaccine. Finland's National Institute for Health and Wefare recommended Tuesday halting the use of the Pandemrix swine flu vaccine until a probe into a possible link to narcolepsy among children is concluded. "At the moment we are not having a (swine flu) epidemic, so there is no immediate need for vaccination," the agency said in a statement. "Besides, major parts of the population are protected against the swine flu virus either through vaccination or or after having swine flu," it added. According to YLE, the head physician of the Finnish Medicines Agency, Kari Lankinen, says doctors failed to report their suspicions of swine flu vaccine side effects due to fears, for example, that they might have difficulty publishing in international journals. This demonstrates the insidious impact of political correctness in medicine these days. ...concern children aged between 12-16 years who developed symptoms compatible with narcolepsy, a chronic sleeping disorder, that occurred one to two months after vaccination against the H1N1 pandemic. The (Swedish) Medical Products Agency said it was in contact with European Union member states for information on any similar reports in other countries. Narcolepsy is a serious condition: suddenly falling asleep without warning leads to many accidental deaths, especially in children and young adults. There is no known cure. The vaccine linked to seizures in children in Australia, and halted for small children in the UK and Australia, is this year's flu vaccine. It contains the swine flu antigen plus other components. It is not yet known how the seizure problem relates to the swine flu component, nor whether this season's vaccine may cause narcolepsy. However, CDC is crowing about the fact the vaccine is already on pharmacy shelves and CDC has recommended it for everyone over 6 months old. Outside a pandemic, flu is not expected to occur in the US until December at the earliest. CDC appears to want us vaccinated before information on the vaccine's risks emerges. CDC ordered 160 million doses made, expanded the target group of vaccinees to include the entire country, and now CDC needs to ensure those vaccines are injected, not rejected (like last year). The larger point is not whether this vaccine causes narcolepsy. Different vaccines have caused different side effects, and usually a variety of side effects may occur in a minority of recipients after any vaccination. The point is that if you don't look for them, you will miss the side effects. With 100 times the vaccinated population of Finland, why has the USA's CDC failed to identify any serious potential side effects? Why hasn't it held off vaccinations pending ongoing research in at least the US, UK, Australia, Finland and Sweden? All public health programs need to have reliable data on hand before new vaccines or other public health strategies are used on a mass basis. Every intervention entails potential benefits, risks and costs. How significant is the expected benefit? Does it justify the cost? What are the risks, what is the incidence of side effects, and on balance, does the proposed intervention provide a significant net benefit commensurate with its cost? Until US public health policy makers get back to these basics, individuals will have to scrutinize new programs for themselves to determine whether they make sense. Why are we funding CDC when instead of providing us useful information, CDC prefers to muddy the water in ways harmful to our health and pocketbook? CDC's 10 billion dollar budget could perhaps be better spent inspecting our food supply. Former Conservative leader Michael Howard has thrown his weight behind demands for a full inquest into the death of the government weapons expert Dr David Kelly. His call came after a group of prominent experts described the official explanation for the scientist's death seven years ago as "extremely unlikely". Lord Howard - who is now a Tory peer - said their intervention confirmed his belief that there should now be a proper inquest. "In view of the growing number of relevant questions that have arisen and cast doubt on on the conclusions reached by Lord Hutton, I believe it would now be appropriate for a full inquest to be held," he told a national newspaper. "Recent evidence by the first police officer on the scene, together with new statements by doctors raise serious questions which should be considered. This has been on my mind for quite a while and recent events have crystallised my view..."
Nine of the country’s leading doctors today dramatically question the verdict that Dr David Kelly killed himself by slitting his wrist. The eminent medical experts say it is unlikely the weapons inspector could have bled to death in the way the authorities claim – raising fresh doubts that it was suicide. In an open letter to ministers, they also urge the Government to conduct a full coroner’s inquest to re-examine key medical evidence surrounding the case. The move heaps huge new pressure on the Coalition to reopen the investigation. The doctors are experts in the fields of forensic science, intensive care and law, and include Sir Barry Jackson, past president of the British Academy of Forensic Science. Eight of the nine have never expressed their opinion on the Kelly affair publicly before. Their intervention shows the continuing deep disquiet among senior medics about the way Dr Kelly’s death was investigated by the Hutton Inquiry – dubbed a ‘whitewash’ by critics. They join a growing chorus of experts who have made their concerns public. Officially, Dr Kelly, 59, took his own life in woodland near his Oxfordshire home in July 2003 by cutting the ulnar artery in his wrist with a blunt pruning knife. But a female colleague who served with him in Iraq, Mai Pederson, says a hand and arm injury had left him ‘too weak’ to cut his own wrist. Witnesses say there was little blood at the scene. And experts have doubts that he lost sufficient blood to cause his death. It also emerged after the Hutton Inquiry that no fingerprints were found on the knife Dr Kelly is alleged to have used, and that he was not wearing gloves when his body was found. 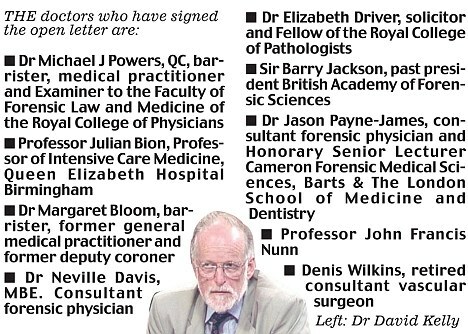 The doctors voice their concerns in a letter to The Times newspaper. Thanks to the Mail for pursuing this important case. A more detailed piece the following day is here. The death of Dr David Kelly still worries many thoughtful people. It is easy to see why. Dr Kelly’s concerns about the Government’s case for war in Iraq began a storm of controversy at a very inconvenient moment for Downing Street. They stirred up the wrath of New Labour’s vengeful and ruthless propaganda machine. These events led to a sort of show trial of a public servant with a fine reputation and a long record of diligence and competence – who, paradoxically, shared the Government’s concerns about Saddam Hussein. But there was never any satisfactory ­conclusion to this process. Dr Kelly never felt able to speak fully in his own defence. His close family, as is their right, have always preferred to stay silent about his feelings and about what pressures may have been placed upon him in his final days. His violent death therefore deprives us of essential information about one of the most important political and military ­controversies of our age. This would be troubling under any circumstances. But it is made far more perplexing by the cloud of doubt which surrounds the event itself. No proper inquest was ever held, itself an extra­ordinary circumstance. And in the absence of a proper, open examination of his death under English law, that cloud of doubt grows and grows. It may well be that all was exactly as we have been told, and that his death was a simple suicide. Indeed, many of the circumstances make that a reasonable conclusion. But with each independent account of the discovery of the scientist’s body, new questions are raised. The apparent absence of blood at the scene has always been a concern, since Lord Hutton’s report concluded that he had died from loss of blood. Now, thanks to the recollections of Det­ective Constable Graham Coe, it is an even greater concern. DC Coe is an experienced police officer who has been present at the aftermath of many deaths. The fact that he confirms the view of previous witnesses – that very little blood was visible at the scene – is a significant new development and strengthens the case for an inquest to be held. The new Government should listen to that case, and so end the damaging ­uncertainty about how and why Dr Kelly came to die. The letter to all GPs from Prof David Salisbury, said: "Epidemiological information from Australia indicates that there has been a higher than expected increase in febrile convulsions in children related to the use of Fluvax (manufactured by CSL). "This is the same product that will be marketed in the UK by Pfizer as Enzira and generic influenza vaccine for the 2010/11 influenza vaccination season. "Evidence from Australia suggests a rate of febrile convulsions of about one per 100 for children who were vaccinated with Fluvax. This increased risk appears to be a product specific reaction and evidence from Australia of vaccination with other products has so far not indicated a similar level of risk. "It is important that children over six months of age who are in clinical risk groups receive influenza vaccination. Given the availability of other influenza vaccine products, you should avoid offering Enzira or CSL Biotherapies generic influenza vaccine marketed by Pfizer to children aged under five years." "Previously approved inactivated influenza vaccines that were approved for expanded age indications in 2009 include Fluarix (GlaxoSmithKline), which is now approved for use in persons aged ≥3 years, and Afluria (CSL Biotherapies), which is now approved for use in persons aged ≥6 months." What a Catch 22: Once the US Government designates someone as a terrorist, it becomes illegal to provide the designee with legal assistance challenging the terrorist designation! The Obama administration announced to the world that it had the right to assassinate an American (Anwar al-Awlaki) citizen without any charges or trial last April. Once you get on the terrorist list, it becomes a crime to offer a designated terrorist any assistance, including legal assistance to challenge the designation itself. Vincent Warren, the executive director of the Center for Constitutional Rights, argued that international law did not permit a government to kill people far from combat zones, calling that assassination. And in the case of a United States citizen like Mr. Awlaki, he contended, such a policy also violates the Constitution’s Fifth Amendment — and is a dangerous precedent. Thank goodness for civil liberties lawyers, who have challenged this legal authorization of death squads and extra-judicial killings, combined with prevention of judicial review. (Is John Yoo back in government dreaming up these pseudo-legal arguments, or have the Dems found themselves a new pack of unethical, uneducated and "creative" lawyers?) This legal chicanery doesn't pass the [Constitutional] smell test. I have not been able to find the official announcement of this, but according to Medscape, the "Centers for Disease Control and Prevention (CDC) announced on June 22, 2010 that it would not endorse mandatory influenza vaccination for healthcare workers." This summer, Kellogg recalled 28 million boxes of Froot Loops, Apple Jacks, Corn Pops and Honey Smacks. Dozens of consumers reported a strange taste and odor, and some complained of nausea and diarrhea. The company blamed elevated levels of a chemical in the packaging. "Acute exposure of humans to naphthalene by inhalation, ingestion, and dermal contact is associated with hemolytic anemia, damage to the liver, and, in infants, neurological damage. Symptoms of acute exposure include headache, nausea, vomiting, diarrhea, malaise, confusion, anemia, jaundice, convulsions, and coma." Under current laws, the government has little or no information about the health risks posed by most of the 80,000 chemicals on the U.S. market today. Because the FDA does not know anything about the toxicity of 2-methylnaphthalene, the agency set its limit based on what it knows about the toxic effects of similar chemicals, Michael Cheeseman (of the FDA's Office of Food Safety) said. "In this case, it had an odor and it had a taste, so it was detected," said David Andrews, a senior scientist at the Environmental Working Group, an advocacy organization. "But there are hundreds of other potential impurities that we can't smell and taste, chemicals that we know very little about and the government knows little about."